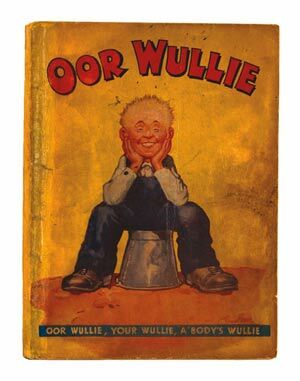 In our auction of June 2002 we offered a dilapidated copy of Our Wullie's first book of 1941. 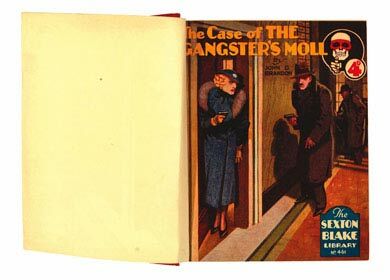 The spine and part of the front and back cover were worn away and the fly page, taking most of the resultant wear down the years, was heavily frayed at the edges. With contents complete it made £688. Five years later with the covers and spine now professionally restored this newly robust example was well bid to a winning £1550. We would add that it is not always the case that restored items do as well or better than well worn originals and often the price involved in creating a professionally restored 'fresher' version often cannot be recovered on resale. 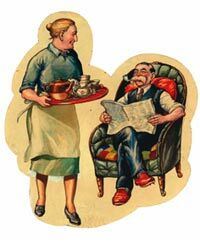 Broons artwork is even rarer to find when fully coloured, and Dudly Watkins had created the above two pieces for the cover of The Broons Book of 1948. Maw an' Paw and Joe and Hen didnae disappoint being taken awa' fir £375 and £205. 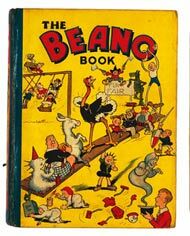 Their rarer hard cover books, not distributed for general sale as the softcovers were, received concerted attention as 1958 reached £154, 1960 and '62 £110 each and 1964 and '66 £85 apiece. Our next catalogue in June will offer the final few hard cover copies consigned to us. 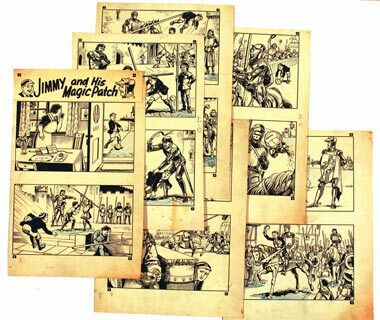 Jimmy And His Magic Patch six-page complete story transported a timely £907 with Dudley Watkin's artwork of his well-travelled schoolboy never having been offered at auction before. 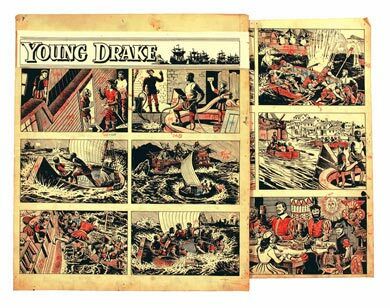 Our continuing run of Young Drake artwork also reached further heights, a two page example bringing £473 safely back to port. 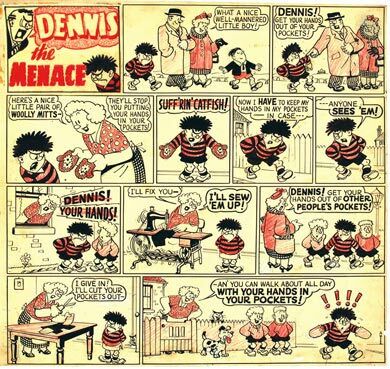 Dennis's artwork didn't Menace as strongly and Davy Law's story of our anti-hero being unwilling to get his hands out of his pockets must have resonated with the bidders who 'only' took him to £700 from an estimate of £800-1000. 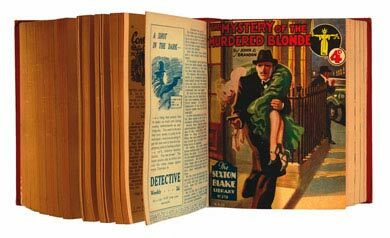 Our 'file copies' bound volume collection continues to sell out with increasingly higher prices achieved for titles like Sexton Blake, where determined bidders are now targeting every issue of this gentleman detective that is offered, ranging between 1921 and 1961 in this auction. The two lots illustrated above each comprised 48 issues in four bound volumes and they found strong winning bids of £507 and £517 respectively. Case solved. 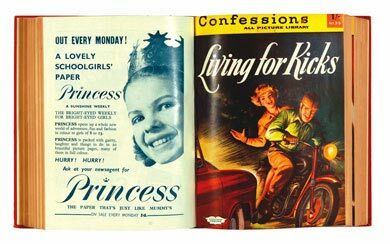 Collectors of girls' comics are a dedicated bunch and these lower print run titles always sell well. 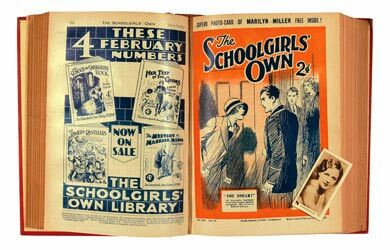 1931's modest Schoolgirl's Own was bid to £250 with the racier 1950s offerings morphing into magazine-style Confessions and True Life All Picture Libraries securing £222 and £341 respectively. 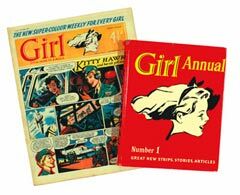 For the first time ever we offered a full run of Eagle's Sister Paper, Girl, including all the annuals and there was huge interest in these 445 issues, prepared in eight lots, volume by volume. 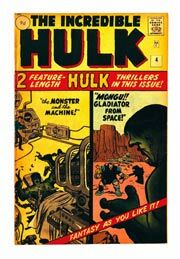 They were secured with a herculean effort by one successful bidder who paid just over £1000 for all of them including buyer's premium. 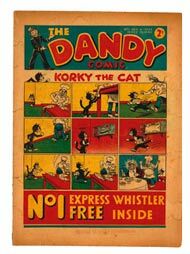 Looking at The Eagle No 1 cover illustrated above, you'd be hard pressed to notice what was different about it, even if you had an original No 1 in front of you; but this issue was extremely rare indeed, being a promotional flyer without the heading 'Dan Dare Pilot Of The Future' and displaying a different date. 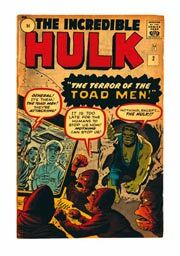 There were probably around 200 of these promos sent out to schools and churches prior to the main print run and we only know of three other copies that exist. A stratospheric £715 was successful tendered for this rare bird. 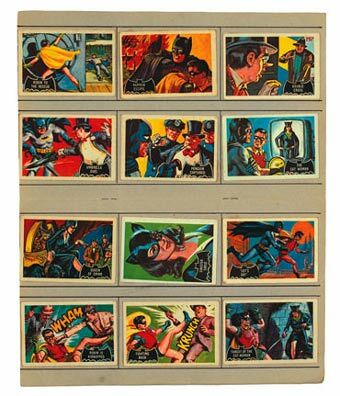 Batman bubble-gum cards by A & BC Gum are quite easy to find but a set in its original picture card album is another proposition and £99 took this scarce set back to the batcave. 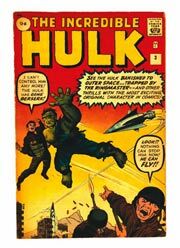 The difficult thing with the cover of Hulk #1 is that most copies inevitably lose their dark blue background colour and fade with age. 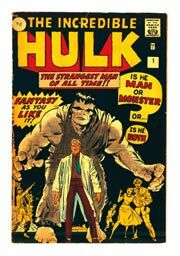 Fortunately this 1962 Fine Minus pence copy had largely retained its original lustre and an Incredible £878 won the day. Similarly issues 2, 3 and 4 monstered £176, £145 and £110, all four copies finding their way to the same dedicated home in Cheshire. 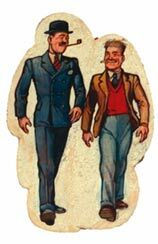 In the 1950s they used to hold a yearly Schoolboy's Exhibition at Olympia, just next to Earl's Court tube station in London. The Hulton Press always used to take a stand for The Eagle Paper (it's co-founder, Marcus Morris, thought it much too infra dig to call it a comic) and various story writers, illustrators and back-room staff were dragooned in to run the stand, chat to the boys and sign copies of the Eagle that they had brought along. I remember the queue for these individuals often stretched for some distance and it took at least half-an-hour to get an audience with your favourite. 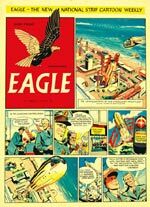 Dan Dare story writer and illustrator, Frank Hampson's line was inevitably the longest and the patient lad who had the foresight to bring along a copy of the Eagle No 1 Promotional Issue and get it signed along the top margin after chatting to the great man was a wise owl indeed. Before you jump to any conclusions, it wasn't me all those years ago, I wasn't that smart. I just bought it from the bloke who was.